In my library’s community, we have a small but growing population of native Spanish speakers. Maybe your community does too, or maybe your largest group speaks another language. In my library, a bilingual storytime means an English/Spanish storytime, which I’ll cover below, but it could mean something different in yours. Regardless, offering a bilingual storytime is a great way to reach diverse populations, and the tips below will apply to any language you wish to focus on. Parents might not attend regular storytimes for a variety of reasons: they don’t speak English well, they don’t know about them, they work during the scheduled storytime, they don’t feel welcome or they’re not aware of the benefits that storytimes deliver. Offering a special bilingual storytime and making sure to promote it to native Spanish speakers lets these families know that they too can take advantage of the library’s services. I hold my bilingual storytimes in the evenings to offer another chance for working parents to make it to the library, and I put Spanish-language flyers out at local Mexican restaurants and grocery stores. 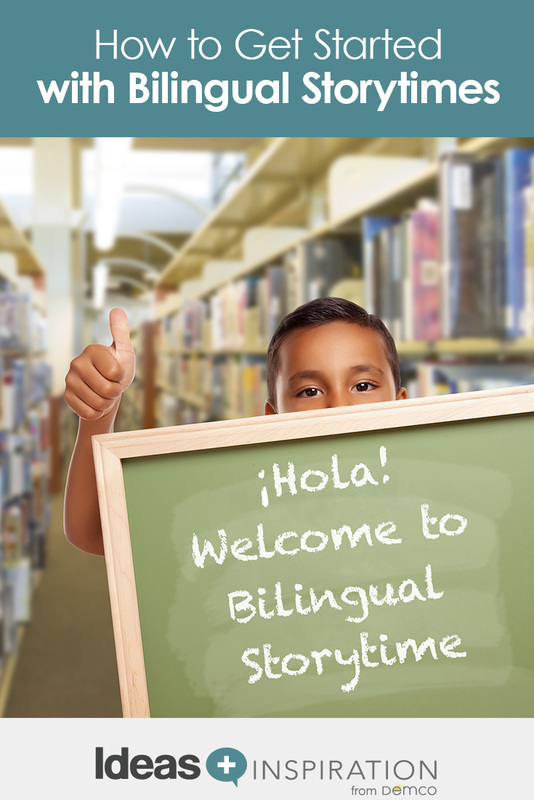 Specifically inviting Spanish-speaking families into storytimes opens the doors to them, helps them feel welcome and gives them the opportunity to learn about other library resources. Children get a chance to experience a great library program, and parents have the opportunity to learn the early literacy benefits of storytime and discover how to extend the learning at home. Just like in my English-language storytimes, we read and sing about counting, colors and letters, including the color song below. I also share early literacy tips in Spanish and model how to share stories and infuse learning into everyday activities. The second group I consider for bilingual storytime is older kids who are native Spanish speakers. Because I offer my program as a family program, I get lots of elementary-age kids. These are kids who often only speak Spanish in the home; some kids don’t want to speak Spanish in public. For these kids, I think it is important to model that speaking Spanish can be a benefit and is cool. I introduce Hispanic authors and illustrators as role models to show that there diversity not only within the stories I share but also in the creators of these stories. Finally, my bilingual storytime is for everyone! For families and kids that are not native Spanish speakers, this program offers them a small introduction to the Spanish language and to other cultures. 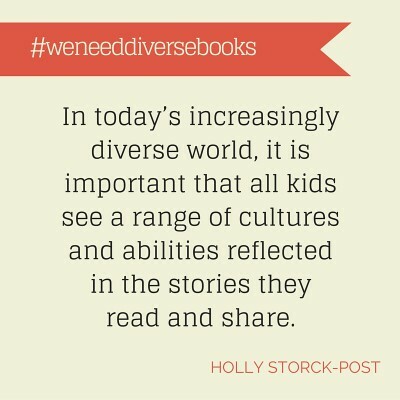 In today’s increasingly diverse world, it is important that all kids see a range of cultures and abilities reflected in the stories they read and share, including both kids who look just like them with whom they can identify and kids who are different from whom they can learn. Most families love the idea of their kids learning Spanish, and bilingual storytime has led to many questions about books, apps, DVDs and other tools for learning Spanish. It has also led to great questions and discussions about other cultures that continue outside of storytime. I start each storytime by singing hello in both English and Spanish. Then I explain how the storytime will run: We sing songs in Spanish, and all the words are up on the wall for parents to follow along. We do activities in both English and Spanish that I explain as we go. And we read books — some that are completely bilingual, some with only certain words or phrases in Spanish and occasionally some that are just in Spanish, with translations as needed. One song we always sing in Spanish is “Head, Shoulders, Knees and Toes.” It has the same tune and actions as the English version, and it is really fun! Here’s another fun song to get both kids and parents moving and grooving. I usually introduce the song by saying we are going to make music with our bodies. We end each storytime with free playtime, highlighting the importance of play, along with the reading, singing, talking (and occasional writing) that we focused on throughout storytime. This also lets parents know that they can do all of this in Spanish! They don’t have to learn English to share books and literacy with their kids; in fact, a child’s first language is best for learning and developing early literacy skills! I try to do all my talking completely bilingually, but depending on my audience I use one language more than the other. If you aren’t fluent in Spanish (or whatever your other language is) that’s ok too! Being able to welcome your families, sing some songs and read books with words in another language is still a great start. You could ask parents to share songs or you can play recorded songs and dance along. (See the resources below for some great suggestions.) You can also use an app! There are some great apps out there, including book apps that will read stories in Spanish and apps like Endless Spanish by Originator that introduce Spanish words. 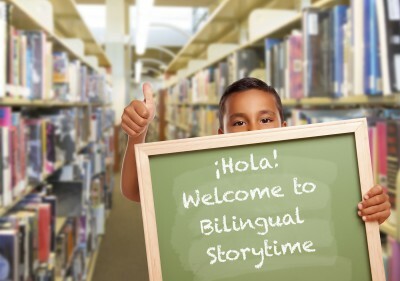 However you start, from just one song in Spanish to delivering a completely bilingual storytime, the important thing is that you begin to offer elements of storytime in another language. To help get you started, visit my blog, Adventures of a Children’s Librarian, where you can find all my bilingual storytimes, with more outlines and book suggestions.